Imagine the well known high quality of a Quanser rotary servo motor experiment that is smaller than our flagship rotary servo base unit. Imagine this new experiment features fully integrated components instead of external, plug-in peripherals. Imagine it is remarkably simple for students to use. Now go further and imagine it comes with proven courseware that helps professors teach some of the same fundamental control principles as the Rotary Servo Base Unit. Interesting? Engineering educators we’ve spoken with have replied with a resounding “yes”. But here’s the most interesting feature about the compact new rotary servo—its cost, which because of its simplicity and compactness is significantly lower than our traditional Rotary Servo Base Unit, in fact low enough to make Quanser’s hands-on approach to teaching controls an affordable choice for virtually any educational institution in the world, no matter what the local economic pressures are. This new solution is called the QUBE-Servo. It will be available from Quanser later this spring. The QUBE-Servo is designed for maximum simplicity and ease of use. When released, it will feature two add-on modules, the inertia wheel and the inverted pendulum. Engineering schools around the world face real funding challenges. As strong as those challenges are for institutions in North America and Europe, they can be daunting for schools in the developing world. Consequently, teaching solutions that are both cost-efficient and effective are needed more than ever. 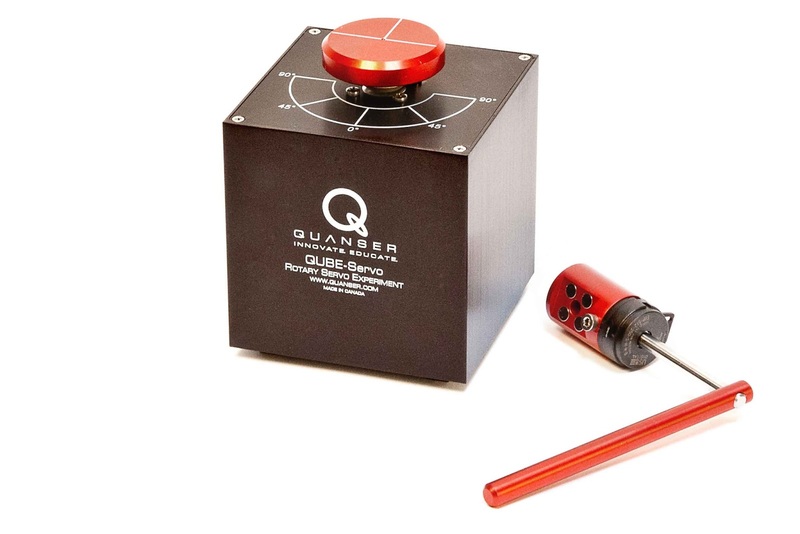 The low cost QUBE-Servo is Quanser’s new turn-key solution to help engineering institutions and educators meet this need. Budget-challenged professors can now outfit their labs with control technology that’s notable for its high quality, ease of use, small footprint and safety, all in a cost effective way. Students will derive a deep learning experience from the QUBE’s hands-on experiments and courseware that allow them to make the connection between their classroom studies to the real world applications and problems they want to solve. Upon release in the spring, the QUBE-Servo will be available with two add-on control modules—the inertia wheel and the inverted pendulum—plus full courseware for both. For the inertia control wheel experiment, students learn first-principle derivation, experimental derivation, transfer function representation, stability analysis, model validation and PD. For the inverted pendulum experiment, students learn state-space representation, balance control, optimal LQR control design, energy-based swing-up control. The QUBE-Servo is a fully integrated plant, with USB-based data acquisition system and amplifier all in one. It comes with two add-on modules that quick-connect to it magnetically. It features one USB 2.0 port that connects to a PC or laptop. No tools or additional cabling are required. The integrated components are fully supported by our Rapid Control Prototyping Toolkit software add-on for LabVIEW™ and our own QUARC® rapid control prototyping software. The data acquisition card has two encoder inputs for the motor itself and for whichever module you connect to it, as well as an analog output to control the motor itself. The PWM-based amplifier has been designed specifically for the QUBE’s motor. The QUBE can also be ordered with a Direct I/O interface that allows the QUBE to be connected directly to an external DAQ. Instead of separate, plug-in peripherals, the QUBE Rotary Servo contains a fully-integrated plant, USB-based data acquisition system and amplifier, all-in-one. Its dimensions (L x W x H) are 102 mm x 102 mm x 118 mm. 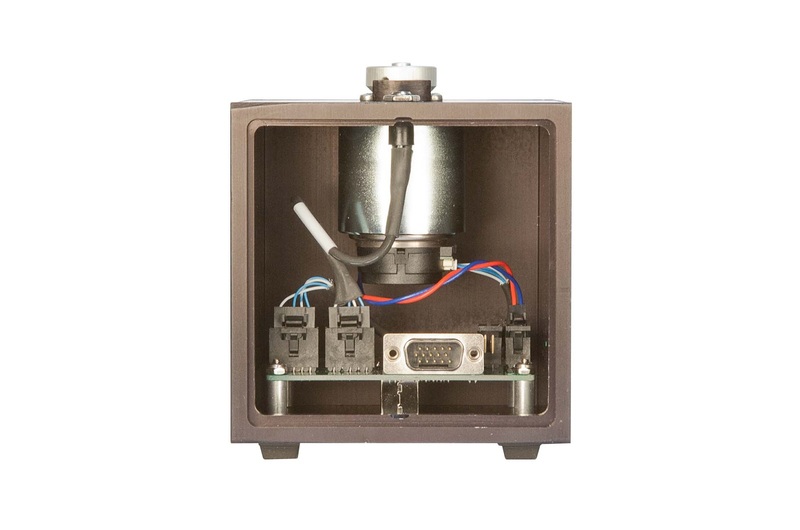 The flagship Rotary Servo Base Unit is designed to be extremely versatile and reconfigurable. It accommodates an extensive system of add-on experiment modules, amplifiers and data acquisition boards. To run an experiment you first select and externally connect the data acquisition board and amplifier you need, along with the rotary plant that you’re actually going to use. Such reconfigurability is particularly useful if you need a flexible lab, or if you are sharing lab equipment across departments with different needs. The Rotary Servo Base Unit currently accepts ten add-on experiment modules and has the bandwidth and robustness needed to validate simple to advanced control algorithms developed by researchers in a variety of application fields and scenarios. The QUBE-Servo provides maximum simplicity and ease of use. Its major components are already integrated into one unit and are not designed to be reconfigured or “swapped out”. Two add-on modules will be immediately available for the QUBE: the inertia wheel and the inverted pendulum. Both allow professors to teach some of the same fundamental control concepts as the equivalent modules on the Rotary Servo Base Unit. The QUBE-Servo will be available this spring. To find out the release date, please contact Abdullah Dhooma, Product Marketing Engineer at Quanser.